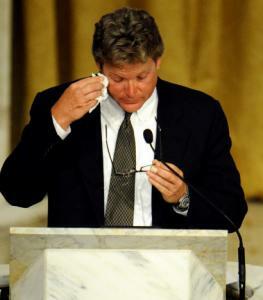 When he stepped to the lectern in Boston’s Mission Church last month to eulogize the father he considered his best friend, Ted Kennedy Jr. mesmerized the nation, and reduced many listeners to tears, with a story of a sled, a snowy hill, and a father’s love. When his father’s memoir goes on sale tomorrow, the younger Kennedy will be back in the national spotlight, standing in for the man who shared his name as he fulfills one last outstanding duty, to promote the legendary senator’s life story. It is an undertaking sure to spur assessments, already rampant, of his potential to inherit the family political mantle. For most of his 47 years, Kennedy has avoided the glare of the media. Friends say he revels in the privacy and normalcy of his life in Branford, Conn., a seaside suburb of New Haven, with his psychiatrist wife, Kiki, and their two children. The family joins in carpools and town soccer games, and they are regulars at the opera house in nearby East Haddam, where Kennedy has dazzled the director with his knowledge of musical theater. Busy with his family, his advocacy for the disabled, and his growing Manhattan asset management firm, Kennedy did not have to volunteer to publicize “True Compass,’’ Senator Kennedy’s autobiography, written before his death on Aug. 25. But to Ted Jr., the senator’s middle child and eldest son, the mission felt essential: to bring a three-dimensional portrait of his father to the public, encompassing his inner life as well as his legislative successes. Ted Jr. “wants the world to see that [his father] was an incredibly spiritual person,’’ said a person close to the family who spoke on the condition of anonymity. An aide said Kennedy was unavailable for an interview in advance of tonight’s kickoff of his media tour. His reemergence into public view, after years of a quieter life, coincided with the decision by his cousin, Joseph P. Kennedy II, to bow out of the race for the Senate, and followed by months his cousin Caroline Kennedy’s decision not to run for an open seat in New York. Their withdrawals, combined with the powerful public response to his eulogy, renewed speculation about his political future. Some of his friends, like Connecticut’s attorney general, Richard Blumenthal, have tried to cultivate his interest in politics. In 1973, when, as a towheaded 12-year-old, he was diagnosed with a rare and lethal cancer, Teddy Kennedy Jr. was first embraced by the American public, which showered him with some 30,000 get-well cards and gifts. The cancer that forced the amputation of his right leg was the defining event of his life, he has said. It struck at his self-confidence, but gave him empathy and a cause to fight for, a way to use the influence that came with his life as a Kennedy. He calls his activism for the rights of disabled people his life’s work, and spends about two hours a day on it, giving speeches around the country and laboring on behalf of the American Association of People with Disabilities, where he is a board member. A graduate of the University of Connecticut School of Law, he used his legal training to further his knowledge of health care, first at a New Haven firm, Wiggin & Dana, where he helped corporations comply with disability law, then as counsel for the Connecticut Hospital Association. He started his own company, Marwood Group, in 2001, and the firm, which offers independent research and advice to corporations and investment funds on health care and other topics, now has 1,000 clients, 100 employees, and offices in New York, Washington, D.C., and London. Kennedy has faced criticism for the segment of his business that markets funds to potential investors, profiting from marketing fees the funds charge investors. A familiar figure in Bay State political circles, he has been helped by his name and connections. The state pension board invested $325 million in a fund promoted by Marwood Group in 2004; the transaction cost the state millions in fees, the Globe reported. Kennedy points to public records that disclose the firm’s dealings as evidence of their transparency and propriety, the person close to the family said. People who know him say Kennedy is grounded. He shares his father’s booming laugh, but has not shown his appetite for reckless behavior. As a teenager, he steered clear of the substance abuse that plagued some of his cousins and his younger brother, Patrick, now a congressman from Rhode Island. When Ted Jr. sought treatment for his alcohol use in 1991, at age 29, the move stunned friends, and seemed prompted as much by his family’s troubles as his own drinking. “I’ve seen what can happen when people don’t address the problem,’’ he later explained. “I’d like to think the Ted Kennedy Jr. story is yet to be told,’’ he told the Globe then. For a time, his story seemed destined to unfold in politics. He considered running for Congress at 23, when then-House Speaker Thomas P. “Tip’’ O’Neill retired, vacating a seat once held by his uncle, John F. Kennedy, but he opted against it, citing other fulfilling pursuits. In the 1990s, he balanced night classes at the University of Connecticut School of Law with his day job at the Yale Lead Program, where he spearheaded the creation of a lead-safe home where families could stay while their children were treated for lead poisoning. In 1993 he married Katherine “Kiki’’ Gershman, an assistant professor of psychiatry at Yale described by friends as serious but warm. The couple won fans in their hometown for helping to defeat a proposed natural gas pipeline in Long Island Sound. But it was Kiki Kennedy who led the grass-roots fight, with her husband happily cheering her on in the background. The family attends shows at Goodspeed Opera House, where Ted Jr. has impressed director Michael Price. “If you say, ‘Who was the original Mordred in ‘Camelot’?’, he would say Roddy McDowall, and I would say, ‘I have to go look it up,’ ’’ said Price. Supporters see Kennedy’s political potential. But they also express deep respect for his decision, so far, to lay low. Jenna Russell can be reached at jrussell@globe.com. Correction: Because of a reporting error, this story misidentified the law school Ted Kennedy Jr. attended . He is a graduate of the University of Connecticut School of Law.